In its Weekly Report On Israeli Human Rights Violations in the Occupied Palestinian Territories for the week of 26 June - 2 July, 2014, the Palestinian Center for Human Rights (PCHR) found that, during the reporting period, Israeli forces killed 4 Palestinians, and wounded 31 others; 19 of them were in the West Bank while 12 others were in the Gaza Strip. The wounded persons included 5 children and 4 women, including the Palestine TV reporter, in occupied Jerusalem. An old woman died of a heart attack when the Israeli forces raided her house and obstructed transferring her to the hospital for medical treatment. 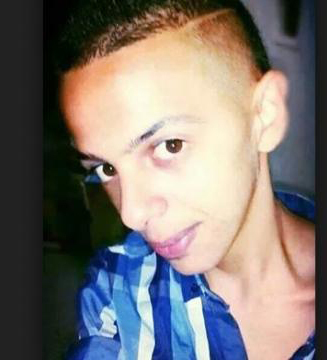 In one of the most heinous crimes committed by Israeli settlers against Palestinian civilians in the oPt, a group of Israeli settlers kidnapped Mohammed Hussein Abu Khudair, 16, from the vicinity of his family’s house in Shu’fat neighbourhood in the north of occupied Jerusalem, subjected him to brutal torture, and then killed him. In the Gaza Strip, Israeli warplanes conducted 24 air strikes, and the Israeli ground forces conducted 5 shooting incidents along the border fence. Moreover, Israeli naval forces carried out 2 shooting and chasing incidents. During the reporting period, Israeli forces killed 4 Palestinians, and wounded 31 others; 19 of them were in the West Bank while 12 others were in the Gaza Strip. The wounded persons included 5 children and 4 women, including the Palestine TV reporter, in occupied Jerusalem. An old woman died of a heart attack when the Israeli forces raided her house and obstructed transferring her to the hospital for medical treatment. In one of the most heinous crimes committed by Israeli settlers against Palestinian civilians in the oPt, a group of Israeli settlers kidnapped Mohammed Hussein Abu Khudair, 16, from the vicinity of his family’s house in Shu’fat neighbourhood in the north of occupied Jerusalem, subjected him to brutal torture, and then killed him. In the Gaza Strip, Israeli warplanes conducted 24 air strikes, and the Israeli ground forces conducted 5 shooting incidents along the border fence. Moreover, Israeli naval forces carried out 2 shooting and chasing incidents. In the West Bank, on 01 July 2014, an Israeli undercover unit killed a Palestinian civilian in Jenin refugee camp in the north of the West Bank when the area was completely quiet. On 26 June 2014, Fatmah Ismail Ma’abad ‘Issa (70), from al-‘Arroub refugee camp died of a heart attack when Israeli forces raided her family house and detained the family members for an hour denying her access to medical treatment. During the reporting period, Israeli forces wounded 19 Palestinian civilians and arrested one of them. On 26 June 2014, Ismail Ahmed Mahmoud Hawamdah (23) from al-Samou’a village, south of Hebron was hit by two bullets to the shoulder and back when a member of an under-cover unit fired at him during his arrest. Israeli forces then arrested him and took him to an unknown destination. His family learnt later that her son is in “Soroka” Hospital in Beersheba. On 27 June 2014, Israeli forces wounded 4 Palestinian civilians when they moved into Nablus, Balatet al-Balad and Balatah refugee camp, east of the city to secure the way for settlers in order to perform religious rituals in Yousif tomb. A number of Palestinian youngsters demonstrated against them. In the Gaza Strip, during the reporting period, Israeli forces committed two new crimes of extra-judicial execution. In the first crime, 2 Palestinian members of al-Naser Salah al-Deen brigades (the armed wing of the Popular Resistance Committees) were killed. In the second crime, a member of an armed group was killed and another one was wounded. On 27 June 2014, 8 Palestinian civilians were wounded when Israeli tanks along the border fence, east of Khan Younis in the southern Gaza Strip, fired 3 shells at the two minarets of al-Huda and al-Taqwa mosques in Khoza’ah village, which are around 1000-1600 meters away from the border fence. Three women, including a pregnant one and another one with her child in their family house, were wounded while another child, who was in the street, was wounded as well. On the same day, Israeli tanks stationed along the border fence, east of Khan Younis in the southern Gaza Strip, fired 6 artillery shells at the agricultural lands in al-Qararah village, east of the city. Residents of the area were terrified due to the sound of explosions heard all over Khan Younis. No injuries were reported. On 28 June 2014, two Palestinian civilians were wounded when Israeli forces stationed along the border fence, east of Khan Younis, opened fire at the agricultural lands to the west of the aforementioned fence. On 29 June 2014, Israeli tanks stationed along the border fence, east of Khan Younis, fired 5 shells and opened fire at the agricultural lands, east of Qararah village, west of the aforementioned fence. No injuries were reported. In the context of other Israeli airstrikes, in addition to the two aforementioned airstrikes, Israeli warplanes conducted 20 airstrikes on civil targets and paramilitary training sites of armed groups. On 28 June 2014, Israeli warplanes launched 3 missiles at a 1-dunum land planted with olives, east of al-Bureij refugee camp in the centre of the Gaza Strip. This land belongs to Ahmed Mohammed Hlayel (35). As a result, 70 olive trees were damaged and 450-square-meter chicken barn roofed with tin and plastic was destroyed. Moreover, 3000 chicks died and a 50-square-meter house was destroyed. A fodder store and a barrack were destroyed, and a sheep died. On 29 June 2014, Israeli warplanes conducted 8 airstrikes targeting sites and facilities of armed groups in Gaza City, the central governorate, Khan Younis and Rafah. As a result, the targeted sites were damaged, and windows of nearby houses were broken. Moreover, 9 windows of an UNRWA health clinic in the Saudi neighbourhood in Rafah were broken. In addition, 3 civilians, including a child, were wounded due to the flying glass. On 01 July 2014, Israeli warplanes and helicopters conducted 11 airstrikes, during which they fired 44 missiles targeting training sites of armed groups, agricultural barracks. As a result, 3 employees of the agricultural control were terrified. All the airstrikes were conducted in almost the same time all over the Gaza Strip, except the central governorate, causing fear among civilians due to the strong sound of the explosions. In the context of targeting Palestinian fishermen in the sea, on 28 June 2014, Israeli gunboats stationed off Khan Younis shore in the southern Gaza Strip, opened fire sporadically in the vicinity of the Palestinian fishing boats sailing 4 nautical miles offshore. On 01 July 2014, Israeli gunboats stationed off al-Waha shore, northwest of Beit Lahia town in the northern Gaza Strip, launched a number of shells at open areas, east of the coastline. No injuries or damages to the boats were reported. During the reporting period, Israeli forces conducted at least 90 military incursions into Palestinian communities in the West Bank. During these incursions, Israeli forces arrested at least 76 Palestinians, including 8 children. 8 of them were arrested in Jerusalem while 9 others were arrested when Israeli forces intervened during the Israeli settlers’ attacks against the Palestinian civilians. Following their declaration of the disappearance of 3 Israeli settlers in Hebron in the south of the West Bank, since Thursday evening, 12 June 2014, Israeli forces carried out a large-scale military campaign against residential communities in the West Bank and night raids of houses using tracker dogs and maltreating the house residents by expelling them outside their houses or detaining them in one room. 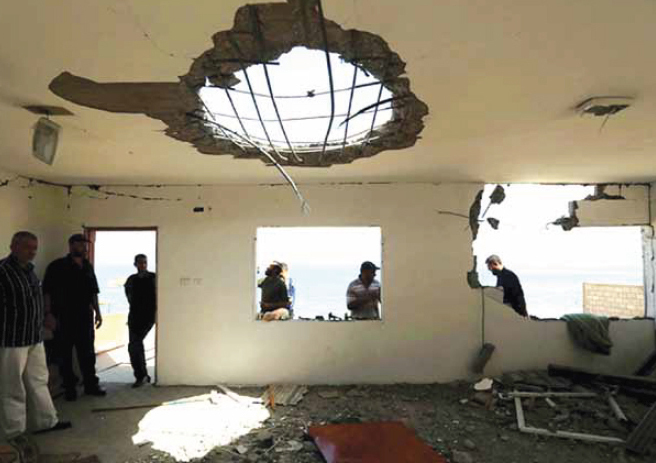 Moreover, Israeli forces turned many houses into military barracks and deliberately damaged those houses. Most of the campaign was mainly targeting Hebron, but it extended all the West Bank governorates. On 26 June 2014, Israeli forces raided and searched the building of Hend al-Husseini Faculty of al-Quds Abu Dis University in al-Sheikh Jarrah neighbourhood in occupied Jerusalem. They then left the building, and neither destruction nor confiscations were reported. In a serious precedent, Israeli forces destroyed 2 houses belonging to the families of Marwan Sa’di al-Qawasmi and ‘Aamer ‘Omar Abu ‘Eisaha in Hebron, on the ground of suspicions that the two Palestinians were involved in the abduction of the three Israeli settlers, before arresting, questioning and convicting them. On 02 July 2014, Israeli forces raided Dar al-Israa’ Library for Printing and Distributing and confiscated computers and checks belonging to Taher Dandis. They also raided al-Asil Centre and confiscated computers. On the same day, the Israeli forces raided al-Ihsan Charity in Da’eret al-Seir area, north of Hebron. They confiscated computers and documents. On 02 July 2014, they destroyed the house of Ziad Khalil Hassan ‘Awwad (43) from Ethna village, west of Hebron. It should be mentioned that the Israeli authorities accuse the aforementioned civilian of killing an Israeli officer near Bypass Road (60). The illegal closure of the Gaza Strip, which has been steadily tightened since June 2007 has had a disastrous impact on the humanitarian and economic situation in the Gaza Strip. The Israeli authorities impose measures to undermine the freedom of trade, including the basic needs for the Gaza Strip population and the agricultural and industrial products to be exported. For 7 consecutive years, Israel has tightened the land and naval closure to isolate the Gaza Strip from the West Bank, including occupied Jerusalem, and other countries around the world. As part of using military checkpoints and border crossings as traps to arrest Palestinian civilians under the pretext they are wanted, Israeli forces arrested 2 Palestinian civilians, including a child, at military checkpoints in the West Bank. On 28 June 2014, an Israeli infantry force moved from “Avigal” settlement which is established on confiscated lands, east of Yatta, south of Hebron, and raided Kherbat Om Al-Khair. They prevented civilians from Al-Hathalin family from establishing a barracks of tents and tin for one of the families there. Moreover, Israeli soldiers verbally abused the civilians. On 28 June 2014, Israeli forces backed by several military vehicles and a jeep belonging to the construction and organization department in the Israeli Civil Administration moved into Shueika village, north of Tulkarm. Israeli forces stationed west of the village and handed 3 civilians 3 notices to stop construction work in their houses under the pretext of having no construction permit to build in the areas classified as “C” according to the 1993 Oslo Agreement. On 26 June 2014, a group of settlers from "Kiryat Arba" settlement which is established on confiscated lands east of Hebron, accompanied by a number of Israeli soldiers, attacked a house belonging to Al-Ja'bari family in Al-Ras area, east of Hebron. The settlers and the soldiers attacked the family and beat them up. Israeli forces arrested 8 civilians. On 28 June 2014, a group of settlers from "Susya" settlement which is established on confiscated lands south of Yatta village, south of Hebron, took their sheep into Palestinian civilians' lands in Al-Rakhim valley area, and ruined their crops. The settlers moved into a tent belonging to Izz Ghaith and stayed in it for several hours. On 30 June 2014, two settlers attempted to kidnap Mousa Rami Zaloum (9) when he was walking with his mother in Sho’afat neighbourhood in the north of occupied East Jerusalem. On 30 June 2014, a group of settlers from "Beit Aein" settlement which is established on confiscated lands, west of Beir Amr village, north of Hebron, cut 15 olive trees ( aged between 3 to 5 years ) in Abu Rish area, west of the village, belonging to Hammad Jaber Al-Sleibi. On the same day, a group of settlers from "Ramat Yishai" in the middle of Tal Al-Rumaida neighborhood, in the center of Hebron, attacked Majed Mamoun Sultan (19) when he was returning to his house. As a result, the aforementioned civilian sustained wounds to his head. Israeli soldiers moved into the area then arrested the aforementioned civilian and took him to an unknown destination. On 1 July 2014, a group of settlers deployed at the entrance of Kafer Laqef village, east of Qalqilya. At approximately 01:40, Israeli forces arrived at the place and evacuated the settlers. No further events were reported. On the same day, a group of settlers gathered near "Kedumim" settlement and threw stones at Palestinian civilians' vehicles passing through the main street between Qalqilya and Nablus. As a result, the front glass of a taxi driven by Ayman Muhammad Al-Jadaa' from Hibla village, south of Qalqilya, was shattered. On the same day, a female Israeli settler deliberately ran over Snabil Muhammed Fahmi Al-Tous (9), near Al-Ja'ba village, southwest of Bethlehem. The settler threw the child in a hole on the main road and tried to escape. A group of civilians caught the settler and handed her to the Israeli police. Then they took the child to Beit Jala government Hospital for treatment. The child's wounds were serious. As a result, several demonstrators suffered tear gas inhalation and others sustained bruises as they were beaten up by Israeli soldiers. Following the Friday Prayer on Friday, 27 June 2014, dozens of Palestinian civilians and international and Israeli human rights defenders organized a peaceful demonstration in Bil’in, west of Ramallah, in protest at the construction of the annexation wall and settlement activities and in solidarity with Palestinian prisoners on hunger strike. Demonstrators took the streets raising the Palestinian flags and headed to the liberated territories near the annexation wall. Early in the morning, Israeli forces closed all entrances to the city to prevent Palestinian civilians and international and Israeli human rights defenders from participating in the protests. Protestors marched by the annexation wall and tried to cross the fence. Israeli soldiers stationed behind the wall, in the western area, and a large number of soldiers deployed along it, fired live bullets, tear gas canisters, rubber-coated steel bullets, sound bombs and waste water at them and chased them into the olive fields. 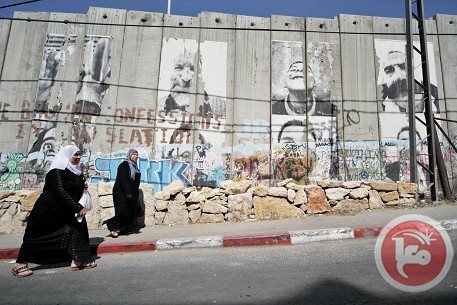 On the aforementioned day, dozens of Palestinian civilians organized a peaceful demonstration in Nil'in village, west of Ramallah, in protest at the construction of the annexation wall and settlement activities and in solidarity with the Palestinian prisoners on hunger strike. The demonstrators made their way towards the annexation wall. Israeli forces closed the wall gate with barbwire and, when the demonstrators attempted to access the lands behind the barbwire, they were stopped by Israeli soldier. The demonstrators threw stones at the Israeli soldier who responded with live ammunition, rubber-coated metal bullet, sound bombs, tear gas canisters, and waste water at them and chased them into the village. At approximately 13:30 on the aforementioned day, dozens of Palestinian civilians and international activists organized a peaceful demonstration in the centre of Kafr Qaddoum village, northeast of Qalqilya, in protest at the closure of the eastern entrance of the village with a metal gate since the beginning of the second Intifada. Protestors threw stones at the Israeli soldiers who fired live bullets, tear gas canisters, rubber-coated steel bullets, and sound bombs in response. On Friday afternoon, 27 June 2014, dozens of Palestinian young men and women gathered at the western entrance of the Silwad village, northeast of Ramallah, on the road between Silwad and Yabroud villages near Bypass (60). Demonstrators threw stones at the aforementioned road. In response, Israeli soldiers stationed in the area fired live ammunition, rubber-coated bullets, sound bombs and tear gas canisters at the demonstrators. During the reporting period, in an extra-judicial execution crime, Israeli forces targeted two members of an armed group in the central Gaza Strip. Immediately after the execution, the Israeli Defense Force spokesman announced their responsibility for the incident. He claimed that the targeted members were responsible from firing a number of rockets recently. No passersby were wounded in the explosion but the glass of windows in the nearby houses shattered as a result. The cooking gas crisis has fluctuated for 9 months due to the closure of Karm Abu Salem for security claims. According to PCHR’s follow-up, Israeli authorities only allow an average of 98 tons of cooking gas into Gaza per day. This limited quantity is less than half of the daily needs, which is 200 tons per day of the civilian population in the Gaza Strip during winter. The crisis has unprecedentedly aggravated for around six weeks due to cold weather and overconsumption in addition to the power outage and using gas as an alternative in many instances of electricity. The lack of diesel and benzene led to the aggravation of the crisis as a result of using the gas cylinder for cars or as an alternative for benzene to run generators. As a result, the demand for gas further increased. For almost 6 consecutive years, Israeli forces have continued to prevent the delivery of construction materials to the Gaza Strip. Two years ago, Israeli forces approved the delivery of limited quantities of construction materials for a number of international organizations in the Gaza Strip. On 17 September 2013, they allowed the entry of limited quantities of construction materials for the private sector. However, on 13 October 2013, they re-banned it claiming that these materials are used for constructing tunnels. Last week, Israeli forces allowed the entry of construction materials only for UNRWA and UNDP projects. As a result, construction works have completely stopped impacting all sectors related to construction and an increase in unemployment levels. The Egyptian authorities allow the population of the Gaza Strip to travel via Rafah International crossing, which connects the Gaza Strip with the outside world. Only limited and specified categories are allowed, including patients, students, persons that hold residencies in Egypt or abroad, men over 40 years, females in all ages, children under 18, persons who hold Arab and foreign nationalities, and members of Arab and international humanitarian delegations. Supposedly the crossing opens seven days a week. Nowadays, the crossing is overcrowded due to the prolonged procedures from the Egyptian side, particularly after closing it for several days over the past weeks due to Egypt’s security conditions, which has affected the travelers’ movement in both directions. The International Monetary Fund on Thursday said the economy in the West Bank and Gaza is weakening and urged Israel to lift restrictions on the Palestinians. After briefing the international donor community and the Palestinian Authority, IMF mission chief Christoph Duenwald said in a statement that the authority is "doing a commendable job" managing the economy in difficult circumstances. He said the global donor community needed to step up to help fill a "sizable" financing gap this year for the authority. "Against the background of rising political uncertainty, the economy of the West Bank and Gaza is weakening," he said. "Unemployment, particularly youth unemployment, currently at 43 percent, continues to rise from already high levels," he added. "Continued donor support is vital at this time, as is a comprehensive easing of Israeli restrictions to underpin the Palestinian reform efforts." According to a February forecast, the IMF saw the economy in the West Bank and Gaza growing 2.5 percent this year, up from 1.5 percent in 2013.